This is co-edited by me and Kyle Baddeley-Read. Its a 48 page science-fiction / fantasy anthology. Halfway between A4 and A5 in size, black and white with colour covers. It features work by Max Mose, me, Kyle Baddeley-Read, John Robbins and Pete Batchelor. 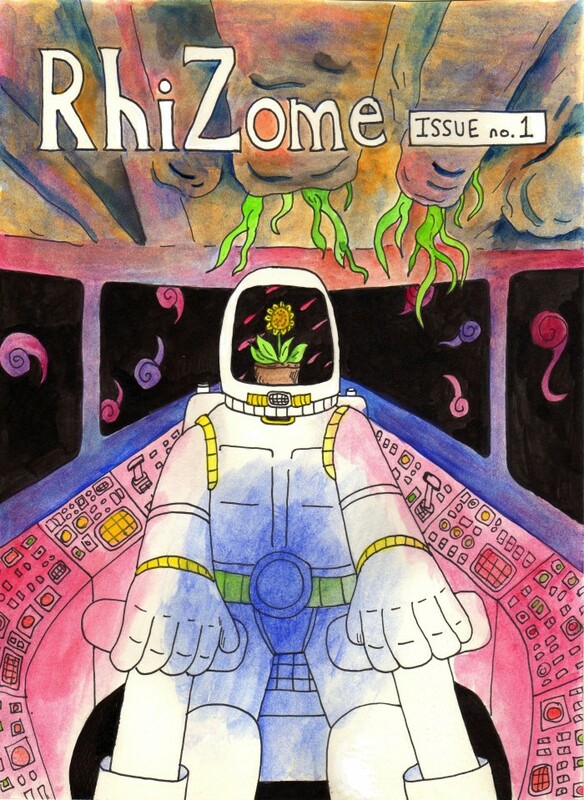 Here’s a preview of the comic, and here’s the RhiZome tumblr. I can’t help it, it’s just been beaten into me over the years: I get nervous whenever somebody puts the first part of a continuing story in an anthology. I’ve been proven wrong to be nervous about this before, but I’ve also been proven right plenty of times. Which is to say that Rob Jackson has a fascinating first part of a story in here, and I’d really rather the rest of the story wasn’t lost forever because there was never a second issue of this series. Eh, don’t mind me, I’m working on being less pessimistic in the new year. The other stories are all self-contained, so no worries there. These other stories include Max Mose’s tale of a civilization wandering the stars in search of more of the nuclear weapons that destroyed their homeworld, Kyle Baddeley-Read and his piece on the benefits of child slavery (to the children), John Robbins with his story of a man who discovers a giant hole in his stomach and his conversations with his therapist about it, and Pete Batchelor’s tale of a man who thought that he had outsmarted the apocalypse by freezing himself and thawing himself out in 2130. Pretty great stuff all around, and it all added up to a really odd and fantastic vibe for the book as a whole. Oh, and Rob’s story, as I mentioned, won me over completely. It’s all about a man who’s annoyed at getting his new job while also happy because he desperately needed the money. Which wouldn’t be that odd of a story, but this man goes into his first day and finds another man there who has his name and who kind of looks like him. This is more than just a simple coincidence or there’d be no story here, obviously, but the direction that it seems to be taking has me really curious to see what happens next. So check it out, is what I’m saying. Even if future parts of Rob’s story disappear completely (and he has a pretty good track record of finishing his stories so far), then this works perfectly well all by itself.